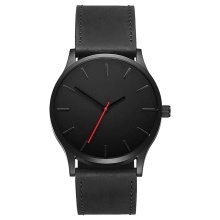 This is a fashion men watch has personalized and simple appearance. It is suitable for every occasions and matches with your apparel. Unique designs, embodies your special temperament. Dull polish leather watch band makes you have an excellent wear experience. Quartz movement provides precise and accurate time keeping. Perfect for all kind of business, casual, indoor and outdoor activities. A good present for your relatives and friends who you love.